Handheld phone, loved for its handy keyboard and hated for its terrible web browser, dies at age 20. Was once the go-to device of millions. President Obama couldn't put his down. It was a good run. But the BlackBerry that you all once knew and loved has passed away. BlackBerry announced on Tuesday that it would no longer make the BlackBerry Classic -- a model that used the old QWERTY keys and was popular before the age of touchscreen smartphones. Ralph Pini, chief operating officer and general manager for devices at BlackBerry, wrote in a blog post Tuesday that the Classic and its predecessors were an "incredible workhorse device for customers, exceeding all expectations." "But, the Classic has long surpassed the average lifespan for a smartphone in today's market. We are ready for this change so we can give our customers something better," Pini wrote ... in what essentially is the device's obituary. The title of the post was "Change is Only Natural: A Classic Model Makes Way." Pini began it by touchingly (pun intended) writing that "Sometimes it can be very tough to let go. For BlackBerry, and more importantly for our customers, the hardest part in letting go is accepting that change makes way for new and better experiences." BlackBerry (BBRY), the Canadian tech company formerly known as Research in Motion, has been struggling for years due to increased competition from Apple (AAPL) as well as Samsung and other companies that make phones running on Google's (GOOGL) Android software. Pini said that BlackBerry will continue its new focus on smartphones that run its BB 10 operating system as well as ones that run on Android, such as the BlackBerry Priv. BlackBerry said that current Classic owners should check with their wireless carriers about whether they will continue to support the device. The company also said that customers looking to buy an unlocked version of the Classic can do so at BlackBerry's online store. The move may be sad to these BlackBerry owners ... as well as many gadget lovers who still have fond nostalgic memories of their first BlackBerry. But the writing has been on the wall for the old BlackBerry QWERTY devices for awhile. Many big businesses have ditched the BlackBerry in recent years. So have consumers. Even government customers, who had largely remained loyal BlackBerry fans because of the device's reputation for security, are starting to sour on the old BlackBerry models as well. Poltiico reported last week that the U.S. Senate will no longer issue BlackBerry devices to staffers. Shares of BlackBerry fell more than 1.5% Tuesday. The stock is now down nearly 30% this year. Related: Will BlackBerry ever get taken over by a larger tech company? BlackBerry has struggled to prove to Wall Street that it can survive on its own. The stock fell about 15% last year as well. 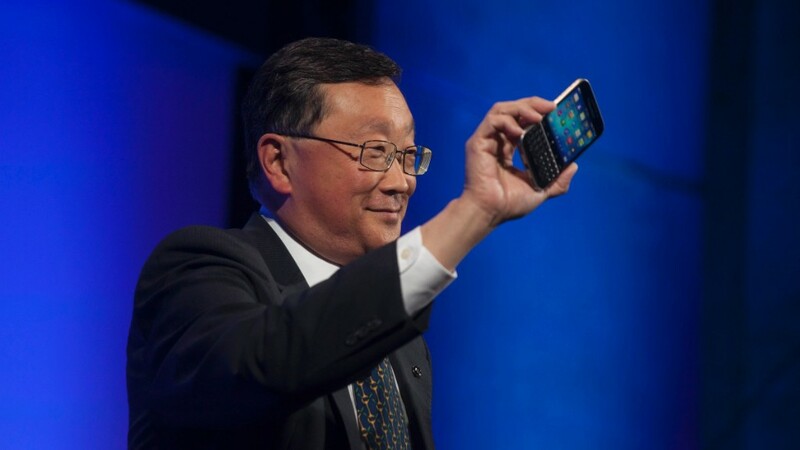 That's why CEO John Chen, who took over in late 2013, has slowly but surely moved BlackBerry away from its hardware roots and focused it more on software. The company reported last month that sales from software and services in its most recent quarter accounted for nearly 40% of total revenue. Still, the company barely broke even. Some investors have also hoped that BlackBerry could wind up selling out to a larger tech company. There have been several rumors during the past few years about Samsung possibly being interested. But none have come to pass.